Moms Demand is at the capitol today. They also bussed in people from out of town. They'll no doubt be greeted warmly by certain Committee Chairs. The squeaky wheel gets oil. While we sit around and do nothing. Would be nice to have a rally of our own on a Saturday. Much easier to attend rallies when big money groups pay for you to go there. Most of us pro-2A folks have jobs, and bills to pay, and no one footing the bill for us to go to the Capitol. 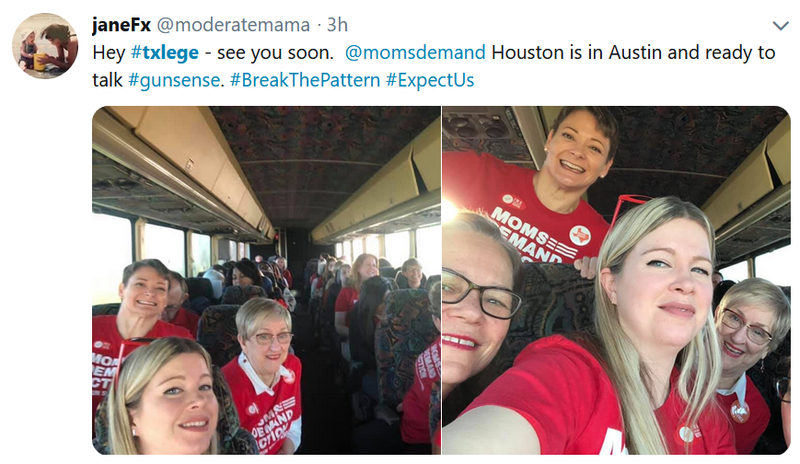 Fitting that the gun grabbers wore commie red. I am most interested in SB117 this session. This is the bill that clarifies the school activity law that the Houston, Galveston County, and Brazoria County fair and rodeos have been hiding behind to post illegal 30.06 signs. Over the last couple years I have filed several complaints on these, but still see illegal 30.06 signs at the Houston Rodeo. The year before last Mark Henry actually contacted me concerning the Galveston County rodeo and had the signs removed without me having to file a complaint with the attorney general’s office. I’ve been on a crusade on this for the last few years so this bill is important to me. I noticed that this bill is already moving. It has been read and referred to State Affairs. This is actually encouraging to me. Although I live in Bonnen’s district, I really haven’t thought much about him. He has always supported things that were important to me. Perhaps we are overreacting. I don’t know. We will have to see how this session unfolds. If SB117 passes, I will consider it a huge success for our 2A rights. I’m growing weary of filing complaints that aren’t being addressed because of a loophole in the law that this bill should fix. Yeah, we’ll find out definitively what putting venemously anti-gun democrats into the chairmanships of the committees which usually process gun legistiaion will do for us. Any negative result will be 100% on Bonnen’s shoulders. He didn’t HAVE to give hard lefties control of those committees. Same with the San Antonio rodeo. This year I noticed they were randomly wanding people coming in. I’m willing to bet if this passes they’ll just not post but still deny entry if you set off a wand or the detector. How does one remedy that? It’s happening now at concerts and other venues with no clear remedy in sight. Disarm and enter or stay out and be irritated. Gonna probably take someone with money to file suit to get these incidences to stop. If you get them afraid of being sued and loosing thousands if not millions every time they violate someone’s rights maybe things will change. For now I’m just not that confident it will. Aren't these rodeos classified as professional sporting events anyway, which by statute is prohibited from carrying anyway? Sure, the rodeo proper is. But not the livestock show, carnival rides, or concerts. Same as it is at the Ft.Worth Fat Stock Show and Exhibition. 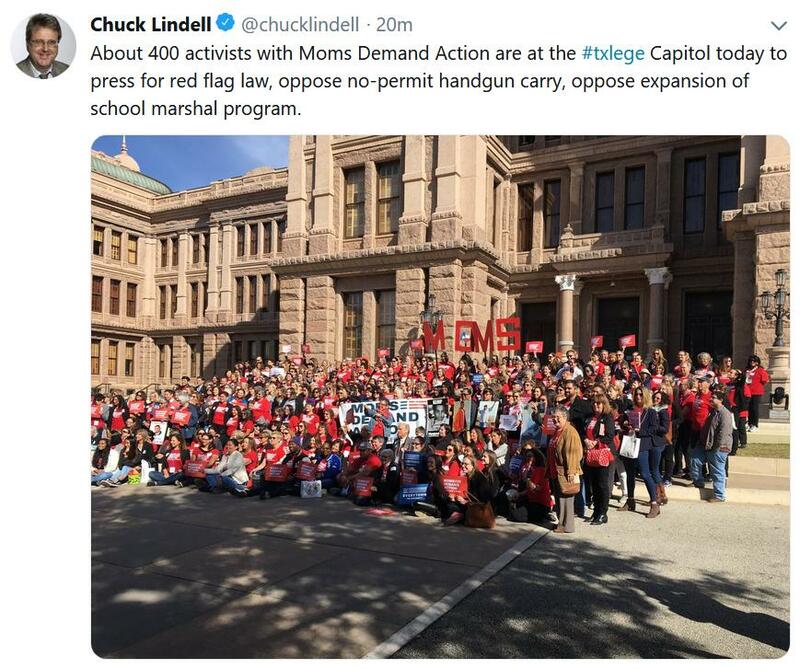 Constitutional Carry on the Ropes in Bonnen’s House? The window is narrowing for the bill to receive a public hearing with enough time to survive the legislative process. The March 18 post indicated Texas House Homeland Security and Public Safety Committee Chairman Poncho Nevarez (D–Eagle Pass), an appointee of Texas House Speaker Dennis Bonnen, had told Stickland directly he was uncertain the bill would receive a public hearing at all. Even if it did, whether it would come soon enough to beat the 30-day calendar requirement to reach the floor was also uncertain, possibly providing a cop-out for leadership looking to absolve themselves of responsibility on the campaign trail next spring in Republican primary contests. Now, several authors or coauthors in the Texas House are telling Texas Scorecard they have encouraged Nevarez to hold a hearing for the public to be able to voice their support and to allow the committee to vote on the bill. “I firmly believe HB 357 should be brought up for a hearing and a vote before the Committee on Homeland Security and Public Safety,” said Rep. Dewayne Burns (R–Cleburne). “I have consistently encouraged Chairman Nevarez to bring the bill forward, and hope he will do so,” Burns said. Last edited by mojo84 on Tue Mar 26, 2019 3:36 pm, edited 1 time in total. There's a reason the GOP majority chose him as their Speaker. Saturday is part of the problem. My Representative happens to live next door. He is home on Saturdays. Why organize something when the audience is not there?